The Army Reserve announced today the death of a soldier during a joint training exercise in Alberta, Canada. The incident took place May 5. The situation is under investigation at this time. The name of the Soldier will not be released until completion of next of kin notification. VANCOUVER, Wash. On April 23, 1908, Congress established the Medical Reserve Corps, which later became the Army Reserve, out of a group of 360 doctors to provide a reservoir of trained officers in times of war. On April 23, 2008, the U.S. Army Reserve turns 100 years old with nearly 190,000 proud members belonging to it living in communities across the country. Since September 2001, nearly 2,300 Army Reservists from Washington and 550 from Oregon have been mobilized either in stateside or overseas capacities in support of the Global War on Terrorism. Currently, approximately 70 Oregon and 200 Washington Army Reservists are mobilized. A large portion of these soldiers are part of the 104th Division headquartered in Vancouver that are returning home this month. Approximately 300 officers and enlisted personnel deployed out of the 104th Division from all across the U.S. in April 2007. The majority of the Soldiers augmented the existing staff of the Multinational Security Transition Command – Iraq (MNSTC-I), headquartered in Baghdad. The MNSTC-I is responsible for assisting the Iraqi government in the development, organization and training of the Iraqi National Army and the Iraqi National Police. To date, the Army Reserve has mobilized approximately 190,000 soldiers. Over 42,000 of these have been mobilized more then once either supporting missions stateside or abroad. On April 6, 2008, the 104th Division suffered its first soldier killed in action since World War II. Major Stuart Adam Wolfer, of Emmett, Idaho, was killed in action as a result of enemy indirect fire in the international zone of Baghdad, Iraq. The 36 year old father of three and another Army Reserve colonel from Florida were killed while they worked out in a gym on a Sunday afternoon. Those causalities brought the total Army Reserve hostile deaths to 108 since 2001. Non-combat related deaths of deployed Army Reservists are at 50 while injuries sustained from combat are approximately 1,190. Persons wanting to support the Wolfer family may contribute to the 'Stuart Wolfer Memorial Fund' at any Wells Fargo location. This fund has been set up as a college fund for Maj. Wolfer's girls ages 1, 3 and 5. Local celebrations of the 100th Anniversary include a July 19th Welcome Home Warrior Citizen Ceremony the 104th Division is hosting at the Vancouver Barracks Parade Grounds. The 11:00 AM ceremony will commemorate the 100 years of the Army Reserve as well as honor some of the 300 104th Division soldiers that are returning this month and other Army Reservists returning from around the region. This event, along with having static displays of Army equipment and a community concert by the 104th Division Army Band at 2:30 PM, is joining with the Fort Vancouver National Park "Soldiers Bivouac" event running all weekend. They will have re-enactors and camps from the civil war through World War II set up on the parade grounds. The Army Reserve is joining in that theme displaying the life of the Army soldier of today. The 104th Division will also have a "fun run" starting at 8 AM, where the community is invited to join them in a formation run around the Fort Vancouver area. On Saturday, despite winter-like weather keeping crowds to a minimum, local Army Reservists celebrated the Army Reserve’s 100th anniversary at Portland's PG & E Park. The 104th Division Band performed a pre-game concert, played and sang the National Anthem, and threw the first pitch at the Portland Beavers AAA baseball game. From the “Minutemen” to citizen-soldiers, today’s Army Reserve Soldiers are prepared and available to rapidly deploy anywhere in the world when the nation calls. While simultaneously maintaining their civilian jobs in communities across the nation, the Army’s Reservists are meeting the challenges of today’s war on terror supporting various missions around the globe and at home. In its 100th year, the force celebrates its proud history and century-old commitment to readiness. The idea of a Reserve force in the United States dates well before 1908. The “Minutemen,” who played a crucial role in the Revolutionary War and earlier conflicts, were a part-time elite force which was required to assemble quickly and be highly mobile. Their name originates from their ability to march with a minute’s warning. The United States Constitution of 1789 and the Militia Act of 1792 officially confirmed the reliance of the new nation on citizen-soldiers for defense. All citizens held the responsibility to defend and preserve their rights by serving in the armed forces. These American citizen-soldiers became the backbone of the Armed Forces from the very birth of the nation. At the start of the Civil War (1861-1865), the nation’s regular Army consisted of just over 15,000 men. As casualties mounted, both the North and South started turning to state militias, and in 1863, the Federal government created the first Federal military reserve force - the Veteran Reserve Corps. The corps grew to include 24 regiments and 155 companies, and held combat service roles similar to those of today’s Army Reserve, such as clerks, recruiting officers, guards, and medical personnel. Over 60,000 men served in the corps, but once the war ended, the corps became inactive. While the United States emerged victorious after the Spanish-American War, America learned that it needed a Reserve force of Soldiers that could answer the call to arms at a moment’s notice. The idea of “federal” citizen Soldiers was reborn. On April 23, 1908, Congress established the Medical Reserve Corps—a group of 360 doctors in Reserve status who could be called upon to provide a reservoir of trained Officers in times of war. The Reserve force was expanded in 1916 and again in 1920. Since 1908, the Army Reserve has served with excellence and honor in every major military and humanitarian engagement of the past 100 years, playing integral roles in World War I, World War II, Korea, Vietnam, the Cold War, Panama, the Persian Gulf, Somalia, Haiti, Bosnia, Kosovo, the Iraq War and the Global War on Terrorism. Without the Army Reserve, the United States would not have been able to fight the Great War. More than 160,000 Army Reserve soldiers served on active duty during the First World War. This included about 80,000 enlisted Reservists and almost 90,000 officer Reservists, who served in every division of the American Expeditionary Force, including the Regular Army, the National Army of the National Guard. The Reserve's importance to Army medicine, its original specialty, was particularly striking during World War I—Army Reserve medical officers (29,299) outnumbered Regular Army doctors (920) more than three to one. Of the Army nurses on active duty, almost half (170 out of 403) were Reservists. Army Reserve heroes of World War I included Colonel Theodore Roosevelt, Jr. and America's “Ace of Aces” Captain Eddie Rickenbacker, who set the standard of dedicated service that Army Reserve Soldiers have followed ever since. One of President Roosevelt’s New Deal programs, the Civilian Conservation Corps (CCC), created an opportunity for Army Reserve service during the Great Depression. The CCC was a work and relief program that sent mostly young, unemployed men to work on conservation projects in camps in rural areas. Between 1933 and 1939, more than 30,000 Reserve officers served as commanders or staff officers at 2,700 CCC camps, gaining valuable leadership experience. At the start of the Second World War, only 2,700 Reserve officers were serving on active duty. Within one year, that number jumped to 57,000. By the end of the war, more than 200,000 Reserve Soldiers were on active duty, serving on every front. Roughly a quarter of the Army officers serving during the war were Army Reserve officers. Among the notable Army Reserve heroes of World War II were Lieutenant General James H. Doolitttle, who led the first air attack on Japan in April 1942; Major General William J. Donovan, who headed the Office of Strategic Services – the predecessor of the CIA; and Brigadier General Theodore Roosevelt, Jr., the World War I hero who returned to duty and was the first general officer to come ashore on Normandy beach on D-Day. Five years after the end of World War II, more than 240,000 Army Reserve Soldiers were called to duty for war in Korea (1950-1953). Fourteen Reserve battalions and 40 separate companies actually went to Korea. Seven Reserve Soldiers, including Corporal Hiroshi Miyamura, received the Medal of Honor for their heroism in combat. For the first time, female Organized Reservists were called to active duty in the Korean War. Army Reserve nurses served in hospitals close to the front lines in Korea, including the famous Mobile Army Surgical Hospitals—or MASH units. Many female soldiers took the places of male soldiers needed in combat units. The women reservists of the Korean War answered the call to duty and performed well, setting the stage for an increased role for women in the Army Reserve. While the Korean War was underway, Congress began making significant changes in the structure and role of the Reserve. The Organized Reserve became the United States Army Reserve, which was divided into a Ready Reserve, Standby Reserve and Retired Reserve. More than 69,000 Army Reserve Soldiers were called to action in response to the Berlin Crisis in 1961. The Reserve also stood ready to answer the nation’s call during major events, including the Cuban Missile Crisis. Forty-two Army Reserve Units were mobilized in 1968—35 of these units went to Vietnam. In earlier years, the mission of the Army Reserve was to serve as a “strategic” force; however by the end of the Cold War and Vietnam War, the role of the force was quickly evolving into an “operational” ready force. Operations Desert Shield and Desert Storm led to the largest call for Reserve forces since the Korean War. More than 84,000 Army Reserve Soldiers from 647 units helped liberate Kuwait. Army Reserve Soldiers contributed significantly to the total Army’s success by providing the bulk of water purification and distribution. In fact, the Army Reserve’s 316th Quartermaster Company distributed 8.4 million gallons of water during the Persian Gulf War. The Army Reserve also provided civil affairs support, enemy prisoner-of-war handling, postal work, petroleum handling, military history, and psychological operations. Other participating Army Reserve units included chemical decontamination, transportation, military police, maintenance, and engineering. Army Reserve Soldiers were among the first to fight and were among the last to leave the desert. A key step in the development of the Army Reserve took place in 1991 with the establishment of the U.S. Army Reserve Command (USARC), located in Atlanta, GA. The USARC has responsibility for command and control of Troop Program Units nationwide. 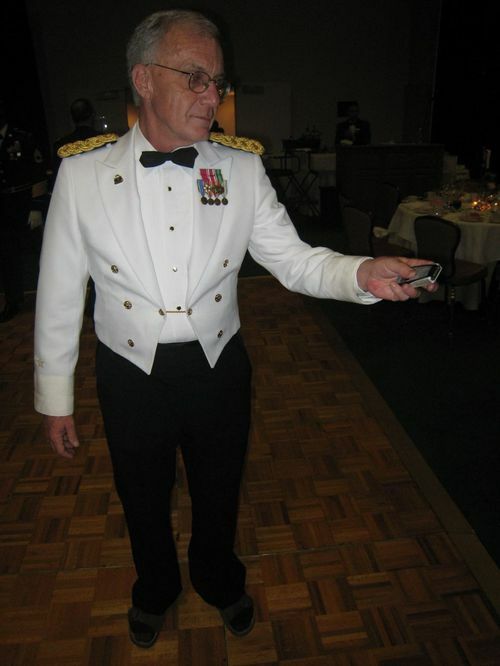 The Chief of the Army Reserve commands the USARC. Since 1991, the Army Reserve has been engaged almost constantly around the world in combat, humanitarian and peacekeeping operations. Reserve Soldiers provided support during the Gulf War and Somalia from 1992 to 1994 and went to Haiti in 1995 to restore democracy. More than 13,000 Reserve Soldiers have been mobilized for the Bosnia operations Joint Endeavor, Joint Guard and Joint Force. Less than a month after the terrorist attacks of September 11, 2001, the United States struck back at al Qaeda in Operation Enduring Freedom. Army Reserve Soldiers were on the front lines from the very beginning of the Global War on Terrorism. Army Reserve Soldiers served alongside active component Soldiers to drive Afghanistan’s repressive Taliban regime from power. When Operation Iraqi Freedom began on March 20, 2003, Army Reserve Soldiers fought their way to Baghdad with other U.S. forces and coalition allies and took down Saddam Hussein’s regime. The Army Reserve remains heavily committed in both Iraq and Afghanistan. Army Reserve Soldiers have been engaged in the development of the emerging Afghan democracy and the Afghan National Army. They continue to battle Iraqi insurgents while laying the groundwork for Iraq’s security forces to take over the mission. More than 190,000 Army Reserve Soldiers have been mobilized since the terrorist attacks of September 11th. Over 40,000 of those have mobilized more then once. Ninety-eight percent of Army Reserve units have provided mobilized Soldiers in Iraq, Afghanistan and 18 other countries. More than 140 Army Reserve Soldiers have lost their lives during Operation Enduring Freedom and Operation Iraqi Freedom. Additional information about the Army Reserve’s 100th Anniversary can be found on-line at www.armyreserve.army.mil. This week, the Army, Navy and Marine Corps announced a decrease, while the Air Force announced an increase. The Coast Guard number remained the same. The net collective result is 131 fewer reservists mobilized than last week. At any given time, services may mobilize some units and individuals while demobilizing others, making it possible for these figures to either increase or decrease. The total number currently on active duty in support of the partial mobilization of the Army National Guard and Army Reserve is 74,156; Navy Reserve, 5,510; Air National Guard and Air Force Reserve, 7,299; Marine Corps Reserve, 8,648; and the Coast Guard Reserve, 344. This brings the total National Guard and Reserve personnel who have been mobilized to 95,957, including both units and individual augmentees. A cumulative roster of all National Guard and Reserve personnel who are currently mobilized can be found at http://www.defenselink.mil/news/Mar2008/d20080319ngr.pdf . (Fort Lawton Release) - About 60 Army Reserve soldiers from units in the Northwest who have returned in the last six months from deployments as part of Operations Iraqi Freedom and Operation Enduring Freedom will receive Welcome Home Warrior Citizen awards Saturday, Sept. 8 at 10 a.m. at Pence Auditorium in Harvey U.S. Army Reserve Center at Fort Lawton, Wash. Soldiers receiving the award are from the following units: 1395th Transportation Brigade, Fort Lawton, Wash.; 382nd Combat Sustainment Support Battalion, Fort Lawton, Wash, 164th Maintenance Co., Fort Lewis, Wash., 175th Transportation Co., Kandle U.S. Army Reserve Center, Tacoma; 467th Transportation Co., Pier 23, Tacoma, Wash., 737th Transportation Co., Yakima, Wash., 970th Transportation Co. Detachment, Eugene, Ore., B Co., 949th Base Support Battalion, Fort Lewis, Wash., 385th Transportation Battalion, Pier 23, Tacoma, and A Co./5/159th Aviation Regiment, Gray Army Airfield, Fort Lewis, Wash. The Welcome Home Warrior Citizen Award was developed to provide an appropriate and enduring memento for soldiers who participated in Operation Enduring Freedom and Operation Iraqi Freedom. The award was established in December 2004 by Lt. Gen. James Helmly, Chief, Army Reserve. MOUNT RAINER, Wash. (Army News Service) - Most of the 6,000 to 8,000 climbers who each year attempt to scale this long-dormant volcano walk off the mountain under their own power. For the unfortunate few who can't - either because of injury or incapacitation - the trip down is often courtesy of an Army Reserve CH-47 Chinook. Supporting the National Park Service climbing rangers who undertake high-altitude rescues on Mount Rainier has been the specialty of the Fort Lewis-based Company A, 5th Battalion, 159th Aviation Regiment, since 1990, said the commander of the 230-member unit, Maj. William Wynn. And it's a specialty that requires a lot of expertise. "High-altitude mountain flying is an especially challenging type of aviation, and it doesn't get any easier when you throw in the rescue aspect," Maj. Wynn said. "Doing both things well requires constant practice, both for us and for the Park Service personnel we work with." Reinforcing the collective skills of the Soldiers and their Park Service colleagues was the point of an exercise carried out yesterday, a practice mission to insert a climbing ranger by rescue hoist onto a narrow, snow-covered section of Ptarmigan Ridge, about 8,600 feet up on Mount Ranier's western side. The task was to "rescue" a human-sized mannequin, and the event was intended to provide training for both the rangers and the aircrew. "We do this type of training every year in order to maintain our proficiency in all the various aspects of mountain rescue flying," said Chief Warrant Officer 3 Richard Bovey, Co. A's standardization-instructor pilot. "It's advantageous for us to take any opportunity to train with the Park Service people." While weather conditions on and around the mountain are notoriously changeable and can be harsh even in late summer, yesterday the skies were crystal clear and the winds moderate. 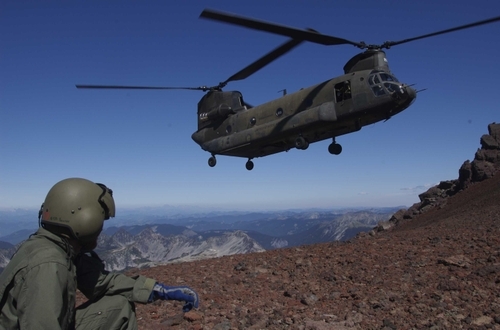 After lifting off from Fort Lewis's Gray Army Airfield, two Co. A Chinooks - one filled with rescue equipment and the other with journalists eager to document the training event - flew to the Park Service's Kautz Helibase. Wedged between a large stream and a wall of trees at an elevation of 3,000 feet at the base of Mount Rainier, the small landing zone is where the Army helicopters usually pick up the Park Service rescue teams. Waiting for the Chinooks yesterday were Mr. Michael S. Carney, Mount Rainier's NPS aviation manager; supervisory climbing ranger Mr. Mike Gauthier; and several rangers dressed and equipped for the winch mission. "We really appreciate the support we get from Co. A," Mr. Gauthier said. "When rescues happen up on the mountain they tend to be intense, complex and challenging missions, and being able to call on the Chinooks is very helpful for the Park Service." During a quick but thorough mission briefing conducted in the shade of the Chinooks' squat fuselages, the Soldiers and Park Service personnel conferred on routes, objectives and safety issues. Then, with everyone aboard, the Chinooks lifted off and climbed steadily upward. Once in position above the ridge the "rescue" Chinook went into a hover and a ranger and the mannequin, both attached securely to a long hoist cable, were lowered through a 3-by-3-foot hatch in the aircraft's belly. Upon reaching the ground the ranger moved the mannequin a short distance away, and was then winched back into the hovering Chinook. The aircraft moved off around a spur of the mountain, then came back in to perform the simulated rescue. Again the ranger descended on the winch cable, and this time moved to, and secured, the "injured" climber. With the simulated victim secure and the ranger safely back aboard, the helicopter then ascended to a point just below Rainer's summit, where it briefly landed before heading back down to the helibase. After dropping off the Park Service personnel, the two Chinooks returned to Fort Lewis, where Maj. Wynn took the opportunity to talk about the value of the mountain-rescue missions, not just to the Park Service and to injured climbers, but also to the aviators and the Army. "These missions are very similar to those that Chinooks are often called upon to fly in Iraq, and especially in Afghanistan," he said. Some of the mountains in the latter are 12,000 feet high and covered with snow year-round, he pointed out, and a mission there to recover a downed Air Force pilot, for example, would be very similar to the rescue missions on Mount Rainier. "By flying these mountain-rescue missions we're not just helping our fellow citizens," Maj. Wynn said, "we're also polishing skills that we may very well have to use in combat. This unit spent 14 months in Iraq, and if we go back, we will be more than ready." The 70th Regional Readiness Command held its final Ball at Fort Lawton as the heavy hand of BRAC readies to close the Seattle installation. The Ranger's own Jessica Corey-Butler attended the Ball and prepares a report in this week's Ranger due on the newsstands Thursday. Meanwhile enjoy this Ball photo of Major General Lawrence Johnson, commanding general of the 70th Regional Support Command. (Notice the Birkenstocks). 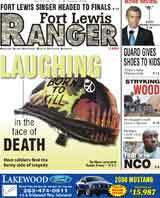 Here's a story from Magnolia News regarding a new unit at Fort Lawton. (AP) — The two women and two little boys found dead after a house fire all died of wounds to the neck, and the fire apparently was set to cover up the slayings, authorities said Wednesday. The home belonged to a soldier serving in Iraq, his wife and their two children. The victims were the young mother, her children and her sister, the King County medical examiner's office confirmed. More story here.